Yum! Hey, thanks for sending June over to the cart. They are such a cute couple! So when are you comin' up to visit? This looooks absolutely bonkers good! I am sooooo going to make these. You will get full credit it! Yum! This is perfect for this weekend! The boys in the family will be surprised for this! I need these in my belly now. Wow, here's a way to impress those carnivores! hah! I am willing to go serious lengths to get vegan wings. 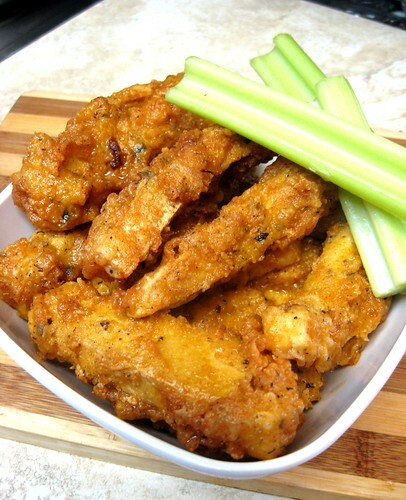 I usually make seitan wings because I love the texture, but these look seriously delicious and I will have to try them. Thanks for sharing! Wish I had found this before the Superbowl! Well, I'll just have to throw another party then. Good recipe! Who would have thought that you were reading my mind's desire for buffalo tofu? I would marinate the tofu with some soy sauce and garlic to add a little flavor to the tofu itself. WOW...I'm definitely gonna try this recipe. Thanks so much for posting this recipe. Almost two years later of making this and they're still so, so good!! I was looking for tofu recipes and luckily i stumbled upon this recipe. Really excited and with the kitchen ready to rumble, I started to prepare and finished this dish no time at all. The verdict - simply delectable. Will be making this again soon at a party. I'm sure it will be a hit! After a tiring game this will be a perfect surprice for the boys! this dish will be their prize if they won the game.